an ARTIST!! 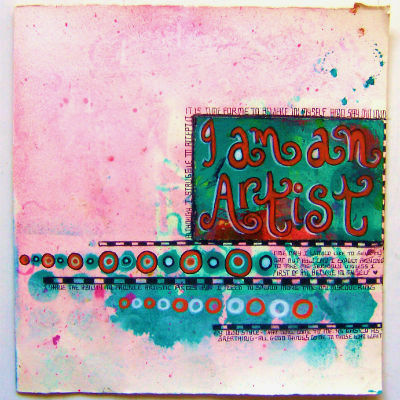 I recently created this journal page after a prompt from Dyan Reaveley on her blog here and it really got me thinking. When DO you call yourself an Artist. Friends and family sometimes say to me Wow you are a great Artist and while I am chuffed when they say that... internally I think.... is the reason they say that because I am doing something they don't do or just because they think something I create is pretty. well I've decided .... HELL YEAH!!! Why? ...... because I love my art... everything I create comes from the heart, it tells a story about me and what comes from within. Whether someone else likes it ...or not... doesn't matter. It is about me!! 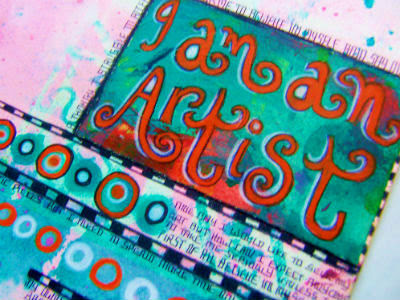 I am an Artist... because I feel like one when I have my pencils, paintbrushes or paper and glue sticks in hand. When I finish something, a sketch, a painting, a journal page... I am filled with a sense of gratitude that I have been given this gift to express myself and it makes me HAPPY. Art hugs me during dark days of depression which lots of us Artists suffer from... it carries me through bad times like nothing and no-one else could. It is my own personal saviour and friend and makes my happy days happier still. One day I may try to sell my art and maybe someone will buy it and maybe just maybe I will feel like a professional Artist... but until then I AM AN ARTIST in my own mind... and that's all that matters. Oh, you can be sure that people would buy your art! Very colourful and bright. Love it!